A selection legal dictionaries and grammar books. Repertorium aureum continens titulos quinque librorum Decretalium, sive Concordantiae utriusque juris. Cologne: Heinrich Quentell, 1495. This text consists of a mnemonic poem to help students memorize the titles of the Decretals – part of the body of canon law – and associated passages. 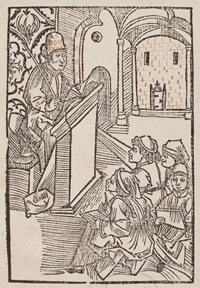 It opens with an image of four students at the feet of their teacher who reads from a pulpit. The image is embellished with ink – perhaps by a rather bored student? Vocabularium utriusque iuris. Venice: Fabio & Augusto Zopinos, 1581. This “dictionary of both laws” (i.e. both Roman and canon law) went through an incredible 70 editions from its first appearance in 1472. This edition is one of many to include a how-to guide for legal studies. The student’s law-dictionary, or, Compleat English law-expositor. London: Printed by E. and R. Nutt and R. Gossling …, 1740. This law dictionary, “compiled for the instruction and benefit of students,” presents the terms in gothic or black letter type – from where we get the term black letter law – and the accompanying definitions in roman type. Giles Jacob. A law grammar, or, Rudiments of the law. 5th edition. London: Printed by His Majesty’s Law-Printers, for W. Strahan, P. Uriel …, [1775?]. When Rastell first published his law dictionary in the 1520s, it was not only the first dictionary of English law, but also the first dictionary of any kind in the English language. Through nearly thirty editions over three hundred years, it was an important text for both practicing lawyers and students of the law. It presents side-by-side definitions in both Law French and English, allowing students the ability to understand the terms while also honing their grasp of both languages. “Learning the Law: The Book in Early Legal Education” is on display October 1 to December 14, 2018, in the Rare Book Exhibition Gallery of the Lillian Goldman Law Library, located on Level L2 of the Yale Law School (127 Wall Street, New Haven CT). The exhibition is open to the general public 10am-6pm daily, and open to Yale affiliates until 10pm. A full catalogue of the exhibit can be found here.